Welcome to the New Setra Site! 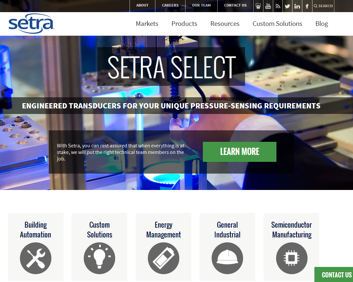 Setra is proud to announce the launch of our new website! For the past five months, Setra’s marketing team has been working hard to develop a new and improved website that offers a user friendly experience and responsive design. Additionally, we went one step further and have rebranded Setra with a more modern and impactful logo. Our goal was to create a superior website which best satisfies the needs of both our internal and external customers. Our new website is more agile, interactive and is easier to scan, read and navigate, enabling our visitors to find what they need quickly. Unlike our old website, our key messages and value propositions are evident and clear. We are utilizing a responsive design, which means that you will essentially see the same design optimized for your desktop, tablet or smartphone. 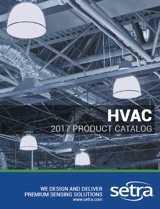 As a technology thought leader, it was important for us to make information regarding the markets and applications we serve as easy as possible to find for our current and prospective customers. With this new website, we make it a point to provide our customers with the most accurate, up-to-date information and share our knowledge and expertise in the field of technology. All of our technical information will be located in the RESOURCES section of the website. This will continue to grow as we edit old and create new content. Our top navigation has all of Setra’s social media sites as clickable icons - we make sure to post at least two blogs a week on relevant content, troubleshooting issues, product promotions, etc. and post to multiple social media sites on a daily basis. On the old Setra website, we had a contact us form on the side of every website. This greatly increased our leads and conversions, so we wanted to be sure we had something similar on our new website. There is now a green CONTACT US button on the bottom right that pops up when clicked. This button will always be at the bottom right side of your screen regardless of where you are on the page. Additionally, with our new CONTACT US button, we are able to see what page the user was on when they filled out the form. It is now easier to find anything you’re looking for while navigating the Setra website with our redeveloped search bar using Google Site Search. The search bar only looks within the Setra website to find exactly what you are looking for. We migrated our blog from Wordpress to HubSpot which gives us more options to customize and orgranize our posts. Creating a new website and rebranding a company is no easy task, but Setra is excited for what is to come. Check out our new website @ www.setra.com!